A president, concerned about the opioid crisis that is ravaging many communities, particularly white, Midwestern communities, invites a retired football player and a famous musician to talk about the crisis. And imagine that this is one of the few high-level meetings he has about the crisis, which has led to the deaths of tens of thousands of Americans. Well, that is kind of what just happened. Not with the opioids, but with the critical, potentially lethal, issues facing many African-Americans across the country. On Thursday, President Donald Trump had a working lunch with Kanye West and retired football player Jim Brown. This was the meeting's preview sent by the White House ahead of time: "The discussion will be centered on President Trump's historic work to benefit all Americans such as urban revitalization, the creation of Opportunity Zones, new workforce training programs, record highs in African American employment, the creation of manufacturing jobs, ideas from his meeting with African American pastors, potential future clemencies, and addressing the massive violent crime surge in Chicago." Shorter readout: This was Trump's black people meeting. What a meeting it was. No cameras were allowed in the lunch, but West's about 10-minute soliloquy in the Oval Office provided a window into the ground covered. Bring Trump factories and Yeezy ideation centers to Chicago. His MAGA hat makes him feel like a superhero. Make the dopest ... no the "flyest" cars. School is boring. Kids should play basketball while they are doing math. Stop worrying about the future. We only have today. Trump and Colin Kaepernick wearing "Make America Great" hats at the Super Bowl. The solution to police brutality is love. Opening up industries and tax breaks. Something about liberals distracting black people by focusing on racism. So, what were the goals here? For Trump, it was a chance for him to say, Trump does care about black people, but don't take my word for it, listen to Kanye West. But what the meeting highlighted was how few African-Americans Trump has in his circle. Omarosa Manigault-Newman, who wrote a scathing tell-all on Trump, hasn't been replaced. The meeting also highlights how seriously Trump takes issues that his base doesn't really care about. Rather than invite real policy experts, say on education or criminal justice, Trump brought before the cameras two famous black men who like him. 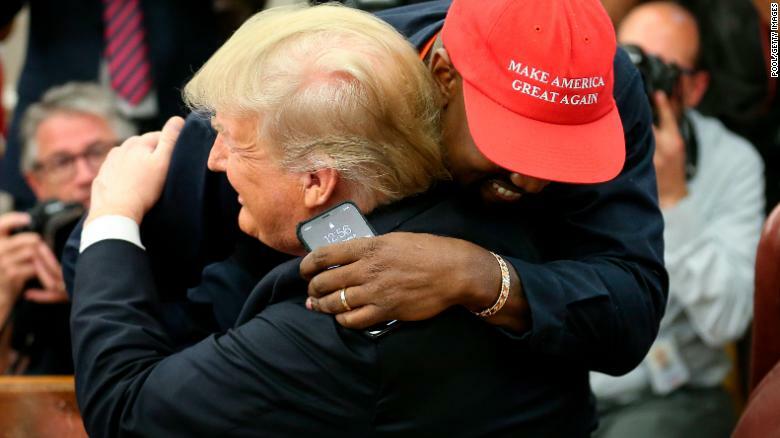 The result was about what one would expect -- a hard-to-parse, bizarre Oval Office moment with very little substance fueled by West's desperate need for attention and Trump's need for open adoration by famous people.